Today drive to Rishikesh via Haridwar visiting the Har-Ki-Pauri, enjoy the AARTI in the evening. Upon arrival in Rishikesh, check in at your pre-booked hotel. Overnight stay at the hotel. Har-Ki-Pauri, Haridwar : The main ghat, Har ki pauri (The footstep of God), is well known spot in Haridwar. The river Ganges begin from here and it is believe to said that if you take a holy dip into the river Ganges here, your all sins will be washed away. Each evening Ganga Aarti is performed by the priests on the Ghat here and holy throngs use to gather here every evening to participate or to see this magnificent view of Aarti. There are several ghats alongside and all the hindu rituals can be seen here being performed on any of these Ghats, like people set floating small lamps on river’s water on downstream which is worth watching act. There is also a famous market called BARA BAZAR adjacent to Har-Ki-Pauri. You can also roam around this place at leisure time. Ram Jhula, Rishikesh : Ram jhula is situated 03 kms north of Rishikesh. It is a very famous place to see amongst all major attractions of Rishikesh because this place has so many significant Ashrams like Geeta Bhawan and Swarg Ashram. Thousand of people come from almost every corner of the world here for religious purposes and get to see the evening Ganga Aarti on Geeta Bhawan’s Ghat.You can also get to see that how hindus worship Ganages. 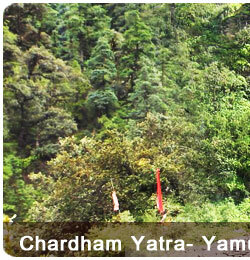 Drive to Hanuman Chatti, trek start to Yamunotri & Back. Overnight stay at Barakot. Today continue drive to Uttarkashi . Check in Hotel, Overnight stay at hotel. Drive to Gangotri. Upon arrival darshan at Temple and back to Gangotri for overnight stay. overnight stay at Uttarkashi. Submerged Shivling : Submerged in the river, this natural rock Shivling is the place where, according to mythology Lord Shiva sat when he received the Ganga in his matted lock. It is visible in winter months when water level decreases. Kedar Ganga Sangam: Around 100 Yards from the Ganga Temple flows the river Kedar Ganga. Starting from the Kedar Valle, this river meets the Bhagirathi on its left bank. After early breakfast, drive to Rudraprayag. Check in at Hotel. Overnight at Rudraprayag : It is the confluence of river Mandakini and river Alaknanda. Temples: Rudranath and Chamunda Devi, Koteshwar Temple (3 Kms). Drive up to Gaurikund, Trek start from Gaurikund to Kedarnath. On arrival, Check in at your pre-booked hotel in Kedarnath .Overnight at Hotel. Gaurikund : At a distance of 5 kms from Sonprayag and at an altitude of 1982 meters., one can take bath in the hot water pond here and visit the Gauri Temple. This is the place where Goddess Parvathi meditated to attain Lord Shiva. It is the base for a trek to Kedarnath. Kedarnath : The Kedarnath shrine, one of the 12 jyotirlingas of Lord Shiva, is a scenic spot situated, against the backdrop of the majestic Kedarnath range. Kedar is another name of Lord Shiva, the protector and the destroyer. According to legend, the Pandavas after having won over the Kaurava in the Kurukshetra war, felt guilty of having killed their own brothers and sought the blessings of Lord Shiva for redemption. He eluded them repeatedly and while fleeing took refuge at Kedarnath in the form of a bull. On being followed he dived into the ground, leaving his hump on the surface. The remaining portions of Lord Shiva appeared at four other places and are worshipped there as his manifestations. The arms appeared at Tungnath, the face at Rudranath, the belly at Madhmaheshwar and his locks (hair) with head at Kalpeshwar. 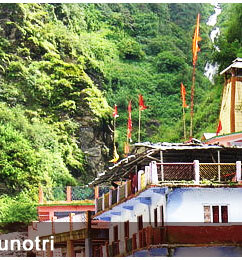 Kedarnath and the four above-mentioned shrines are treated as Panch Kedar. Trek down to Gaurikund from Kedarnath. Drive to Rudraprayag from Gaurikund. Check into your pre-booked Hotel. Rudraprayag : Rudraprayag is a small town on the holy confluence of river Alaknanda and Mandakini which is venerated as one of the five sacred confluences or the 'Panch Prayag'. This place is named after Rudra , one form of lord Shiva. According to a legend Lord Shiva appeared here as 'Rudra' to bless Narad Muni . An ancient shrine is dedicated to Lord Shiva in the form of 'Rudra'. Rudraprayag is of immense significance for the pilgrims of Char Dham Yatra, as it is the junction for visiting Badrinath and Kedarnath Dham. Drive to Badrinath via Joshimath. Check in at your pre-booked hotel. Visit Badrinath Temple.Overnight at Hotel. Day free at your own leisure.Overnight at Hotel. Badrinath Temple : Badrinath one of the 'Four Dhams' is one of the most celebrated pilgrimage spots of the country and is situated at an elevation of 3,133 meters, guarded on either side by the two mountain ranges known as Nar & Narayan with the towering Neelkanth Peak providing a splendid backdrop. This revered spot was once carpeted with wild berries. Thus the place got the name "Badri van", meaning "forest of berries". Tapt Kund : Tapt Kund is an exciting natural spring, which is located in Badrinath, Chamoli District of Uttaranchal. This place is conceived to be the domicile of Lord Agni. Tourists visiting the place will take a bathe in the Tapt Kund prior before they step inside the temple in Badrinath. This natural spring is conceived to hold curative qualities. Moreover, this natural spring holds the unique medicinal qualities and most of the pilgrims visiting the place will take a dip in this kund. Pilgrims consider that, a bath in this natural spring will bestows goodness to their soul and body. 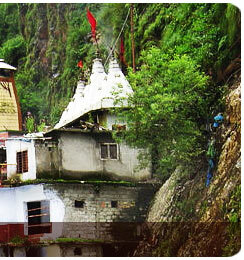 This is the most prominent and striking attraction in Badrinath. Surya Kund : There is another hot water spring besides the Tapt Kund called Surya Kund in Badrinath. Surya Kund is one of them. A good number of tourists and pilgrims visit Surya Kund every year. Another spring is Narad Kund, which is a recess in the river near the Tapt Kund. It is said that the idol of Badrinath was found here. Neelkanth : The towering Neelkanth peak forms the backdrop of Badrinath. The main temple is encompassed on either side by Nar and Narayan, the two mountain ranges just by the bank of the river Alaknanda. The ice-capped Neelkanth peak attracts hordes of tourists during season. There are so many other tourist attractions nearby Badrinath like The Mata Murli Temple (3 km away) is dedicated to the mother of Badrinathji, Mana Village situated on the Indo-Tibetan border Vyas Gufa, Ganesh Gufa, Bhim Pul, and Vasudhara Falls. Morning drive back to Haridwar. Upon arrival check in at your pre-booked hotel. Overnight stay at Hotel. cyprus weather : Cyprus Weather offers detailed weather conditions and weather forecast for the island of Cyprus. It is a CyprusNet portal developed to keep visitors and Cypriots alike, informed on the weather in Cyprus and the climatic changes throughout the day, along with a five day forecast for all major cities and other locations. Beach Wedding - Find a variety of gorgeous Mexico beach wedding property at affordable price. Ladakh Tour PackagesTrekkingtoursladakh is a tourism company of leh ladakh, India. Offer ladakh tour packages, ladakh tour, holiday packages and travel guide to ladakh zanskar during trip. Ladakh tourWe offer information about ladakh touism, ladakh tour and ladakh trekking. Visit to popular tourist places of ladakh during best time and enjoy wildlife tours and treks in zanskar region. Trekking Tour PackagesFind information and guide about trekking in ladakh at wild himalaya, offering trekking tips to adventure ladakh including popular trekking destinations of ladakh like Sham valley, Parang la and Markha Valley Trek. service apartments Bangalore : D-Habitat Centrally located service apartments in Bangalore, one bedroom apartments in Koramangala, 2 bedroom fully serviced apartments in Bangalore, elegant, cost effective, spacious with all modern comforts. service apartments Bangalore : Our Bangalore service apartments offer the value of a hotel for corporate accommodation. Within budget, bed and breakfast guest houses and luxury serviced accommodation. Airport Hotel Bangkok Thailand - At The Great Residence, a Cheap Bangkok Airport Transit Hotels Thailand, conveniently located just five minutes from Suvarnabhumi International Airport and twenty five minutes from Bangkok City Centre. USA Coach Tours - Tours-USA.com is a specialist tour operator offering escorted coach tours and bus tours around the United States of America (USA). costa del sol villas :- Costa Del Sol Villas Available for Rental. Holiday Villas for Rent on the Costa Del Sol. Online Quotes & Availability with Detailed Listings. info orlando vacation rentals Find great vacation rentals in Orlando, Fl. The best rates for Orlando Vacation Rentals. Reserve your Orlando vacation rental today! Coach Holidays : Lochs and Glens Holidays provide high quality coach tours and coach holidays to our beautifully situated hotels in Scotland. href="